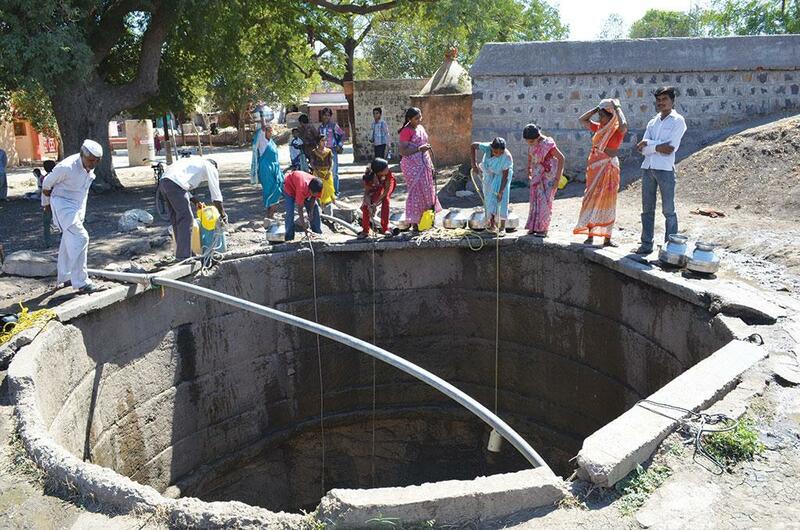 India has put its largest ever groundwater testing for uranium contamination on high gear. Started by the Bhabha Atomic Research Centre (BARC) in 2014, the testing drive, which had slowed down, has again picked up in recent months. The drive is to be finished by 2019 and has a target of checking 0.12 million groundwater samples. Till early 2018, just 10,000 samples had been tested in the project where the Central Ground Water Board (CGWB) is a key partner. The project, which BARC is keeping under wraps, is crucial as several scientific reports have in the recent past pointed at rampant uranium contamination in India’s groundwater. It accounts for 85 per cent of the country’s drinking water supplies. In May, scientists from the Duke University in the US, along with CGWB, Rajasthan Ground Water Department and Gujarat Water Resources Development Corporation, reported that water in around one-fourth of the 324 wells they tested in Rajasthan and Gujarat had uranium in quantities higher than the World Health Organization’s (WHO) standard of 30 µg/l. The study, published in the Environmental Science & Technology Letters journal, also reviewed 68 earlier studies and found uranium contamination in 16 states. Though a naturally occurring chemical, S K Srivastava, a scientist at CGWB and one of the researchers in the Duke study, says, “anthropogenic reasons would also be causing contamination of groundwater”. He adds that fast declining of groundwater table and high use of fertilisers are to be blamed. The study indicates a weak correlation between nitrate contamination, caused by overuse of fertilisers, and spread of uranium in groundwater. A source in BARC says they have found an alarming 600 µg/l of Uranium in 0.8 per cent of the samples. The official, however, adds a pan-country inference can’t be made from this as it involved just a fraction of the total samples to be tested. Like any other contaminants, uranium in groundwater triggers health concerns. BARC’s current testing drive is a consequence of the consistent reports on such fear. Though once in awhile the Centre reacts to such public uproars, they are mostly in denial. In 2012, in its reply to Parliament, the Centre maintained that there were no evidence to correlate cancer with uranium in drinking water. In its reply, the Centre had cited studies from Canada and Finland where high uranium levels were found without any increase in diseases. The findings of the current drive will have several ramifications. 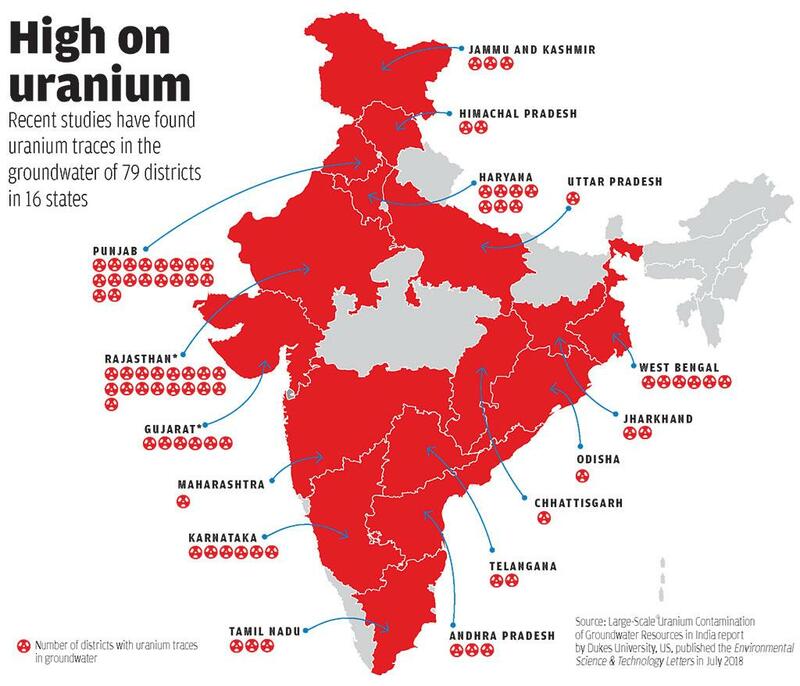 First, being the most comprehensive study ever, it will show the extent of uranium contamination in the country. Second, it would also lay the road map to evolve policy to regulate and mitigate uranium contamination of water sources. One of the fall outs of the Centre’s denial of health repercussions due to uranium contamination of ground-water is that the country only has a standard for its radio toxicity and not its chemical toxicity. And even that is 60 µg/l by the Atomic Energy Regulatory Board, a national regulatory board set up to combat health risks from nuclear sources, which is double of the WHO limit. This, despite the fact, that studies have shown that the chemical toxicity is a greater threat than the radiological toxicity. “If uranium-laced water, more than permissible level, is consumed for long, it can cause thyroid cancer, blood cancer, depression and other serious ailments,” says Digpal Dharkar, founder of the non-profit Indore Cancer Foundation. Some studies have also linked the excessive ingestion of uranium to chronic kidneys disease. In Germany’s Bavaria state, where drinking water has uranium levels of up to 40 µg/l, a team of researchers found weak but significant associations between uranium and tumours, liver diseases and thyroid diseases. The findings were published in the Inter-national Journal of Environmental Research and Public Health in 2017. K C Naik, chairman, CGWB, says if the BARC study finds high levels of uranium contamination in the country, it can prompt the Bureau of Indian Standards to set permissible limits of uranium in drinking water. He adds that this has not happened so far because “uranium concentration is an evolving phenomenon”. He adds that even CGWB is planning to conduct regular uranium analysis in its 16 laboratories. “For this, we are going to have memorandum of understanding with BARC for training and capacity building in September,” he adds. With BARC likely to miss its 2019 deadline, how long will the government wait before seriously acknowledge the health costs of uranium traces in drinking water. (This article was first published in the 1-15th October issue under the headline 'On active mode'). Geo-chemical behavior of uranium in the Sambhar Salt Lake, Rajasthan : Implications to "source" of salt and uranium "sink"